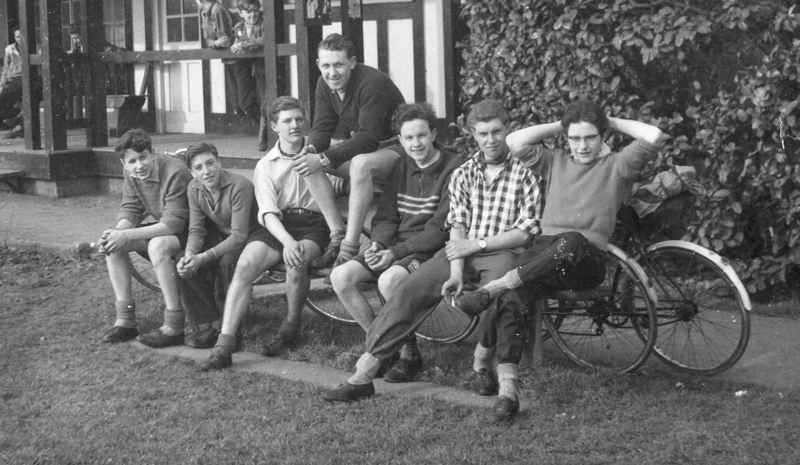 Founded 1949 as part of Snydale Road Secondary Modern School Youth Club,the first meeting was held in a room over Bairstows shop on Pontefract Road Cudworth. Registered as a National Cyclist Union Club May 1949. The club was active for about 10 years, and saw many changes in membership, below are the names of some of the cyclist who were club members. Formed at a time when almost every village had a cycling club, Barnsley C.C. Birdwell Wheelers & South Elmsall Social C.C. founded 1934. are surviving cycle clubs from that era. Club runs were usually about 80 miles with stops for refreshment at friendly cafes, The Old Bent Poker at Otley West Riding Yorkshire, Rose Cottage Castlton Derbyshire, and Walter Hall's Ranch House Blyth Nottinghamshire. Walter Hall's Ranch House was also an overnight stop for cyclist competing in 25, 50, or 100 miles time trials the next morning. also in Germany 1955. These were led by Roger Gough and included George Baldwin, Arthur Parnham, Dorothy May, Denis Pyne, & Paul Barlow. Roger Gough (25 miles in 63 mins 12 sec).